Non-biostatistics majors in Colleges/Departments of Public Health, Allied Health Sciences, Nursing (with Ph.D. programs), and Medical Schools. Any course of study in which introductory biostatistics is required. Non-mathematical/theoretical but with in depth coverage of topics commonly included in biostatistics courses as well as topics not previously covered. This book provides a solid foundation in introductory biostatistics with up-to-date methods, lucid explanations, and a modern approach. KEY TOPICS: Explains commonly used biostatistical methods, such as odds and risk ratios, and Fisher's exact test, in a clear and thorough manner. Introduces equivalence testing in a variety of research settings. Presents nonparametric methods in a modern light, couched in the broader context of permutation-based methods. Provides real-world data with case studies consisting of synopses of published research. Provides step-by-step solutions to exercises, along with pertinent equations used in obtaining the solution and page numbers of relevant discussions. MARKET: For health science students and professionals who need to increase their understanding of biostatistics. 1.5 Why Populations and Samples? For courses in introductory biostatistics. Designed to function effectively in traditional and nontraditional learning environments (e.g. 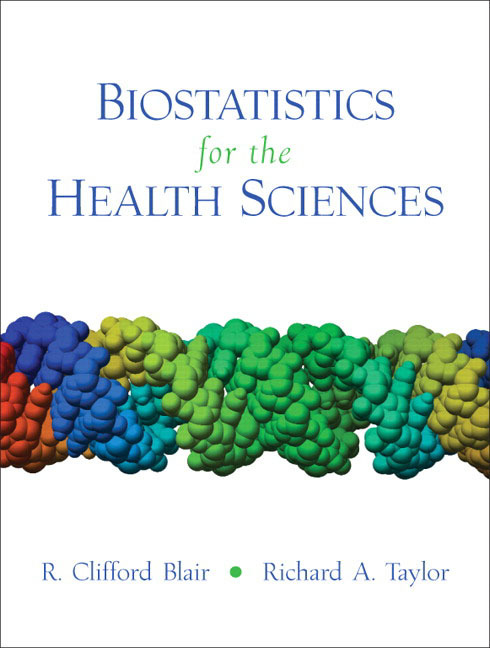 distance learning), this text provides a solid foundation in introductory biostatistics.The author’s clear writing style encourages students’ grasp of statistical concepts in settings that may limit student-instructor contact. The text covers up-to-date methods, gives lucid explanations of commonly used and newer statistical methods, and takes a modern approach to nonparametric methods. • Case Studies consisting of synopses of published research play an important role in forming exercises and examples using real-world data. • Step-by-step solutions to exercises are provided rather than simple answers. In addition, students are given references to pertinent equations used in obtaining the solution as well as page numbers of relevant discussions. • Equivalence testing is introduced in a variety of research settings. Equivalence tests are now commonly used in clinical trials and other contexts, so students should become familiar with their use. • Nonparametric methods are presented in a modern light, abandoning the outdated traditional approach so that nonparametric techniques are couched in the broader context of permutation-based methods. • Elaborate explanations of fundamental concepts, makes this book an excellent choice for distance learning environments as well as traditional classroom settings. Supplemental chapters dealing with Kaplan-Meier estimates and the logrank test, logistic regression, and factorial ANOVA. Software manuals that provide the basis for a computer lab to accompany the course. Among the manuals provided are MINITAB, SAS, SPSS, Stata and R.
Tables of critical values that are more elaborate than space would allow in a book. Clifford (Cliff) Blair is Professor Emeritus and former interim chair of the Department of Epidemiology and Biostatistics in the College of Public Health at the University of South Florida. He has also held faculty positions in the Colleges of Medicine and Education at the same university. He was coordinator of Measurement and Research at The Johns Hopkins University. He is author or co-author of 70 articles appearing in refereed journals of which 44 appeared in statistics or statistics related journals, 21 in medical research journals (including The New England Journal of Medicine), and five in other research oriented journals. He has authored two book chapters. He received the Public Health Student Association Distinguished Teacher Award in the academic year 1995-1996 and again in 1998-1999. He also received the University of South Florida Teaching Incentive Program Outstanding Teacher Award in 1996-1997. His research earned him the Distinguished Researcher Award, presented by the Florida Educational Research Association in 1986.